Can I use cat treats to train my cat, Thomasina? I'd like to teach him to do tricks! I'd do almost anything for my fav Temptations treats, but jumping through hoops isn't one of them! But if your cat's more willing to cooperate than I am, teaching him tricks is one of the ways to use cat treats. I understand clicker training works really well, too. To be honest, I never thought about using treats for anything but very a tasty snack. But then I discovered our human has all kinds of ways to use cat treats in her work. So she's going to take over my blog now (No, that's not okay, but she's the only one who can type!) and tell you about nine ways to use cat treats. 1. As a reward. Our Honey Cat gets treats as a thank-you for taking her medicine. 2. As an incentive. If your cat knows she'll get treats if she appears when you call her, she'll be there every time. Wet food can also be an incentive, especially when you want your indoor/outdoor cat to come in. 3. As a gesture of friendship. Some cats like you for just one reason: You give them treats. 4. As a way to befriend shy cats. Try sitting on the floor and making a trail of treats from the cat's hiding place to you. It might take a few days (or weeks), but eventually the cat should eat his way to you. 5. As a way of getting attention. Shake a bag of treats, and your hiding cat will probably appear. Give her some treats as a thank-you for showing up. 6. As a distraction. Give your cat some treats to keep her busy while you're putting a new collar on or doing something else she doesn't especially like. If you live with a cat who bolts for the door, toss some treats on the floor as you're leaving. He'll be too busy eating to try to get out. 7. As a group activity. If you have several cats, have a treat party as a way of getting them all together for something they enjoy. Put a pile of treats in front of each cat and make sure they're about a foot away from each other so there's no competition. Catnip parties are fun, too. 8. As mental stimulation and exercise. Toss some treats on the floor and let your cats "hunt" for them. Your cat will get more exercise if you toss them across the room one at a time and wait until he comes back to you to toss another one. When you get tired of this, give him two or three treats in a little pile to let him know the game is over. 9. As a disguise for wet food. If you're trying to transition a dry food junkie to wet food or entice a finicky cat to eat, hide a bite of wet food under a pile of treats or mix them in. The cat will eat some of the wet food while he's eating the treats. 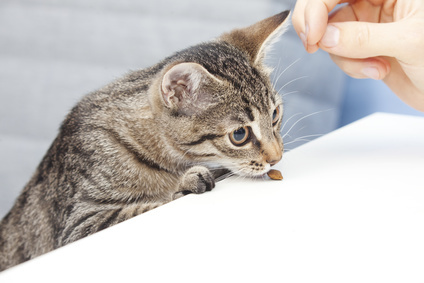 Tip: If you're going to use treats as an incentive or reward for a specific behavior, only give your cat treats then. Or use one kind of treat as the incentive or reward and one that's completely different to give out at random times during the day. This is Thomasina again. I'm back! I'm not big on health food, and my favorite treats are Temptations Shrimpy Shrimp and Creamy Dairy . I like the ones with Jumbo Stuff , too. But if you don't want your cat to eat junk food, here are some other treat foods he'll enjoy. Purebites . We love these chunks of freeze-dried chicken. Buy the kind for dogs. They're the same as Purebites for cats, but the bag is bigger. Deli chicken and turkey. We have chicken parties sometimes, and they're so much fun. Just make sure the chicken or turkey you buy doesn't have any added flavorings or preservatives. Not sure what those are, but my human typist said I should mention them. Bonito flakes . We love these, too. Fish. If you're having fish for dinner, you can give some to your cat as a treat. Actually, any kind of meat you make for yourself can be a treat for your cat, as long as it doesn't contain onions. Vanilla ice cream. You can share ice cream with your cats, too. But don't give them chocolate. Chocolate is toxic to cats. Functional treats. We don't do any of these, but dental and hairball treats are big sellers at pet supply stores. You can get treats that help with arthritis , too. Hey, Tricky Cat Mom, I hope this helps, and good luck training your cat. When you get him to jump through hoops, you'll have to send me a picture!